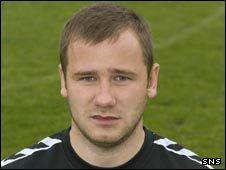 East Stirlingshire midfielder Jimmy Gibson has retired at 26 following the recurrence of an old injury. Gibson has spoken to specialist doctors on a pelvic problem and will now pursue a career away from football. Hailed as a major signing in the summer, the former Rangers, Clyde and Partick Thistle man was key to manager Jim McInally's plans. He last appeared for East Stirlingshire in the 2-1 defeat away to Annan Athletic on 16 August.